Dakinis embody the female aspect of Buddha Energy and symbolize primordial wisdom. They appeared in many forms. Tara (Tibetan: Dolma) is Dakini of boundless compassion and she represents the miraculous activities of all Buddhas. In myth she is born from Avalokiteshvara’s (Tibetan: Chenrezig) tears of compassion to fulfil his mission to liberate sentient beings. 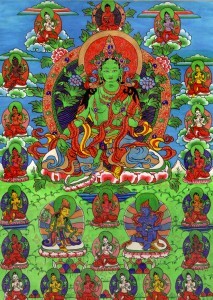 The Noble Tara had manifested to 21 Taras to protect sentient beings from samsaric suffering, particularly the 8 major and 16 minor fears. Her most famous manifestations are the peaceful White Tara, who brings protection, long life and peace; and the dynamic Green Tara, who overcomes obstacles and saves beings in dangerous situations. Traditionally the Dakini day is celebrated every month on the 25th day of the Tibetan lunar calendar. Palyul Center UK honours this day performing the Puja “21 Homages to Tara” and Tara Tsog practice. These prayers help us to pacify all adversities and fears like disease, harm from evil spirits and other obstacles that hinders our success, prosperity and happiness. It brings forth peace of mind and fulfils all our aspirations. For the traditional Tsog Offering if you like you can bring some fruits, sweeties, juice, etc.